I am once again blown away by the kindness of others and their willingness to go above and beyond for us. Over the weekend a group of PEP mothers, the parent group I was in before Gwendolyn became ill, got together and hosted a booth on State Street. 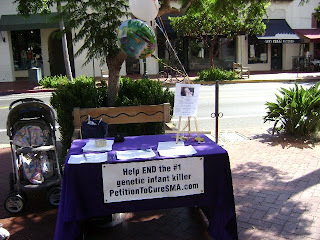 They passed out fliers, spread awareness about SMA, and got tourists and Santa Barbarans to sign the petition. These are all busy moms with babies Gwendolyn's age who gave up part of their weekend to help us...help Gwendolyn. Thank you , thank you, thank you. I know through efforts such as these, this legislation will pass.